· Should you question your lab normal score? Yes. 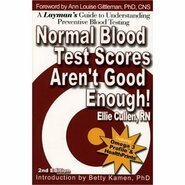 Normal blood tests scores simply aren't good enough! Most clients have scores within the lab normal range. But, those scores are far from optimum! YFH uses its 40 year data base to compute your optimum range and determine your risk factors, NOT just tell you that your scores are in the lab normal range. Knowing your risk statistics is critical in order to detect disease early. YFH has extensively trained their customer service representatives to listen to your concerns and help you choose the best group of blood, urine, and stool tests. Not only does YFH provide you with substantial educational material, YFH provides clients with the ability to attend free group conference calls and webinars (specific to blood test results), seminars (archived to the YFH website), books, DVDs and much more!